AMEC AIS has the ability to transmit and receive in encrypted-mode. This optional feature allows boats in a group to operate stealthily to boats that are not in the group. 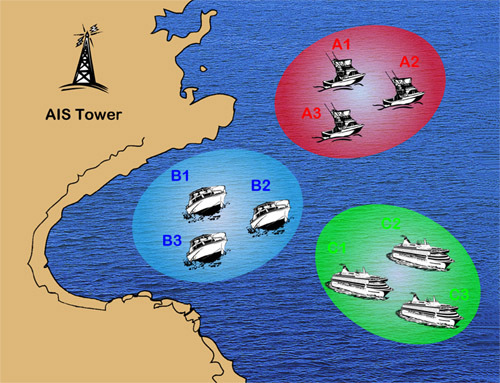 For instance, in the diagram below, boats in their encrypted groups (A, B, and C) can only be “seen” within their own groups. Visibility: Vessels can be seen within the encrypted group including shore based receivers (all encrypted-mode devices). Invisibility: Vessels are hidden to all vessels not in the encrypted group (not encrypted-mode devices). Conformity: Vessels are able to receive from all unencrypted vessels (normal AIS devices).